Barnes & Noble just unveiled its all-new Nook Color, an Android tablet fronted by a 7-inch color touchscreen… so long, e-ink! (Not really, the $149 original Nook is sticking around for now, owns 20 percent of the e-reader market, and is about to get a major software update). B&N is billing it as a hybrid of e-reader and tablet device, and has beefed up its software with a full-on tablet-style UI, along with Facebook and Twitter integration. There’s built-in WiFi (802.11b/g/n) and 8GB of storage, but no 3G at this point. Thankfully, the price stays aggressive as a result: $249. You might think that means the screen is going to be weak, but B&N has managed to put an impressive-sounding “VividView,” 16 million color, 1024 x 600 IPS display in this thing. Interestingly, there’s a “full lamination screen film” on top of the LCD to reduce glare, apparently from the backlight, not just from external light sources. Build-wise, there’s that striking corner handle we saw before (smacks of the XO-3, doesn’t it?) and a microSD slot, with a 0.48-inch thick body and a 15.6 ounce overall weight. Battery life takes a notable hit, of course, with a rating of 8 hours of reading with the WiFi off. Of course, underneath it all is still Android, and Barnes & Noble is launching the Nook Developer program to allow third party apps on the device, and it even ships with a few favorites like Pandora and Lonely Planet. 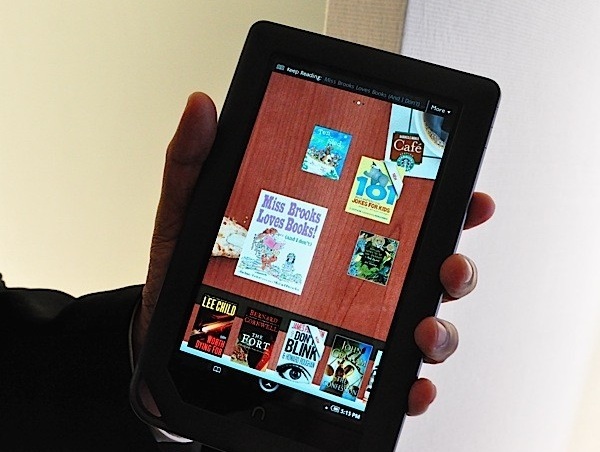 The color screen also enables a new library of “Nook Kids” children books, full-color magazine and newspaper subscriptions, and video playback if you’re in the mood. The Nook Color ships on November 19th, pre-orders are available now.